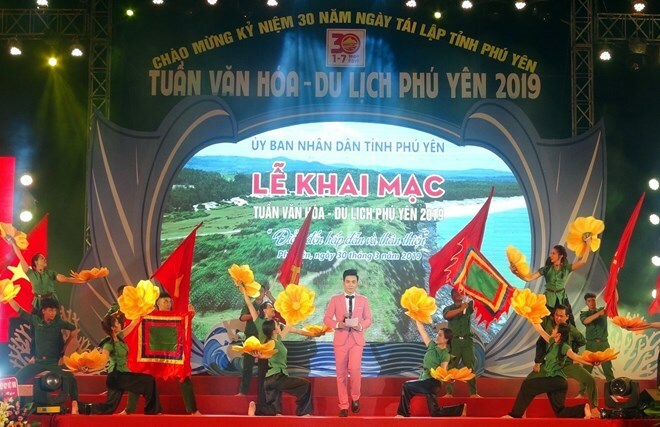 Phu Yen (VNA) – A range of activities introducing the quintessence of central Phu Yen province are awaiting visitors at a culture and tourism week that opened in Tuy Hoa city on March 30. Outstanding events of the week include a tourism, culinary and speciality fair; a kite flying festival; a festival of bai choi singing – part of the UNESCO-recognised intangible cultural heritage; a street music festival; and an exclusive festival of Phu Yen’s cuisine. Notably, the tourism, culinary and speciality fair will feature 100 booths, introducing delicacies of 10 provinces and cities nationwide. Most of the activities will take place in Tuy Hoa city and Dong Hoa district. Vice Chairman of the Phu Yen People’s Committee Phan Dinh Phung said the week is a series of activities on the threshold of many big holidays of Vietnam and the province. It also marks the start of the tourist season in Phu Yen. The week will offer visitors chances to set foot in many famous local landscapes like Xuan Dai Bay, Da Dia Cliffs, Bai Mon (Mon Beach), Mui Dien (Dien Cape), and Nhan Tower. They can experience the uniqueness of local dishes and drinks. Meanwhile, traditional music lovers can immerse themselves in the rhythm and melodies of the art of bai choi, he added.